The Master of Education in Educational Leadership and Policy Studies Higher Education Administration Concentration is designed to teach students to recognize and tackle the unique problems within colleges and universities. 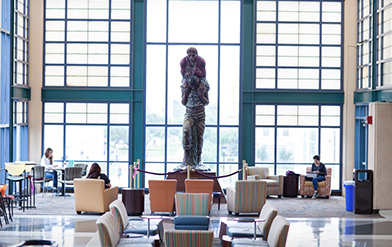 Many postsecondary institutions in the greater San Antonio area recruit graduates with master's degrees for leadership positions in admissions, career planning and placement, commuter student services, counseling services, financial aid, judicial affairs, multicultural services, orientation programs, residence life/housing, student activities, early intervention programs, and community outreach. The higher education concentration prepares practitioners for positions in higher education and student affairs administration at the post-secondary level. The program includes an integration of classroom-based academic learning and field-based experiential learning. Why pursue an M.Ed. in Higher Education Administration? We keep in mind that many of our graduate students work full time, therefore, all of our courses are after 5:00 PM during the Spring and Fall Semesters and are located at both the 1604 and downtown campuses. During their last semester in the program, our Higher Education Administration students take an Internship Course. This course allows students to establish connections with departments in other areas of the university and broaden their knowledge of higher education systems. Our faculty care about our students' educational and professional growth. Each student is assigned a faculty advisor with whom they meet to ensure they are successfully matriculating through the program. Through these meetings, faculty members are able to establish personal relationships with their students. Degree candidates are required to successfully complete a 36 semester credit hour program. The candidate is required to pass a comprehensive examination. For a complete list of degree requirements please see the Graduate Catalog. Required Degree: Bachelor's degree with 18 credit hours in field of study or in another appropriate field of study. General University Requirements: A degree seeking applicant must meet university wide requirements. Application: A complete Graduate School application. Transcripts: Official transcripts from all institutions attended. All international transcripts must be recorded in English or officially translated to English. Resume or Curriculum Vitae: A resume showing at least one year of experience in student affairs or a related field. Statement of Purpose: A statement of purpose of one to two pages is required that provides (1) the applicant’s reasons for pursuing a master’s degree with a concentration in higher education administration, (2) a biographical sketch of the applicant’s experiences relevant to higher education administration, and (3) career plans after obtaining a master’s degree with a concentration in higher education administration. Evaluation of Foreign Credentials: All applicants including non-U.S. citizens (International), U.S. citizens (Domestic), or permanent residents who have earned university-level credit from foreign institutions are required to submit an evaluation from an approved Foreign Credential Agency of transcripts from all foreign institutions attended. If official transcripts are used in the foreign credential evaluation, the official transcript requirement will be considered met. However, if unofficial documents are used in the foreign credential evaluation, final official transcripts must be sent to UTSA. An approved evaluation requires a detailed course-by-course evaluation. Summaries will not be accepted. The Foreign Credentials Service of America (FCSA) is a private corporation that provides evaluations of foreign school credentials. The application is available at: Application for Credentials Evaluation. IELTS: Minimum score of 6.5. TOEFL: Minimum scores of 79 or 60 for Internet or paper versions, respectively. Additional Requirements: A degree seeking applicant must meet international graduate student admission requirements. Master of Education with a concentration in Higher Education Administration: Assistant Director of Student Relations, Resident Director, Academic Advisor, Program Manager, Student Development Specialist, Financial Aid Advisor, etc. Graduate Advisor of Record: Amaury Nora, Ph.D.
We also offer up to four scholarships with awards up to $1000 to master's degree students on an annual basis. During both the Fall and Spring Semester, our courses run from 6 PM to 8:45 PM Monday through Friday. During the Summer Semester, higher education administration coursework typically begins at or after 5:00 p.m.